Gift a Systematic Investment Plan or SIP to loved one this New Year! Before we gift a SIP (Systematic Investment Plan) to our loved ones lets understand what SIP is? SIP is a way to invest money. Perhaps it is the greatest way to invest money. Systematic Investment Plan is considered as the eighth wonder because of the magic of compounding it brings along with it. It is a method of investing in mutual funds. SIP helps you bypass the risk in stock market. It helps you invest in stock market in staggered manner. You chose a certain per-determined amount to invest every month or fortnight in mutual fund. Although some brokerage firms also offer the benefit of doing the same in the stocks rather than any mutual fund. Systematic Investment Plan is an excellent method, to save and invest to keep yourself financially adept for future. Mutual fund is the option we look for more eagerly these days when market is hovering at it life time high and valuations are not cheap either, with pace of economy still in question. Demonetization and reduced interest rates by bank to the people have left very little option for people to invest in many places. MUTUAL FUND is one of such avenue. Approximately, more than estimated 55,000 retail investors are entering into mutual fund on daily basis. This rate of participation was never seen before in Indian history of investment. Return on mutual fund is higher than Fixed deposits but it does have its associated risks. Risk in terms of capital depreciation or loss of capital. You can gift a SIP to the young ones this New Year. You should start a Systematic Investment Plan in name of your child and let the child participation be an active one. If your kids get gifts in form of cash from relatives, encourage them to invest whole or part of that money in MUTUAL FUND. This not only leads to capital formation but adds a habit of saving in children from very early on. Another importance of such investing is that you will never touch this money for future use as emotions are attached to this. Its only during utmost need or during crisis gets used. You can start the investment from as low as Rs 500 every month. That’s all one needs to start a SIP or to gift a SIP. Once you started a Systematic Investment Plan stick to the mantra- start early, invest regularly and stay invested for long term. Thus you allow the money to work for you. And then comes the magic of compounding. 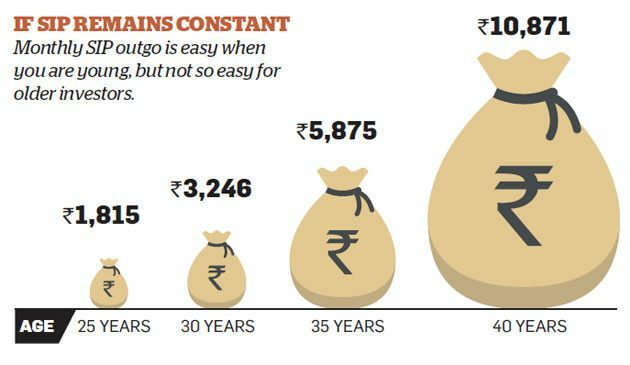 Although many financial advisers will advise you invest for a minimum of 5 years tenure of Systematic Investment Plan but we ask you to go for as long as you can go. Many be 3 to 4 economic cycle. The real magic of compounding if visible after 14th year where the return goes exponentially. So what have you decided this NEW YEAR for your kids. Are you going to surprise your child with SIP this year? It is just like planting a tree whose fruits will be relished by next generation. Stay hungry and stay foolish.